OK, so I´ve been gone for a month... life´s been busy! But I´m coming Back in with a bang - Sailing with old friends on the Pacific Swift for a day - BANG! After three years of missing the Boat (literally) Kellei and I finally managed to get a birth on one of the SALTS member day-sails. Last Monday we made the trip over to Victoria and enjoyed a beautiful day sailing outside Victoria Harbour. It´s been About 15 years (ouch I feel old) since I had been out on any of the boats sailing and this was the first time for Kellei. All of the crew were new to me - but we jumped in nevertheless. 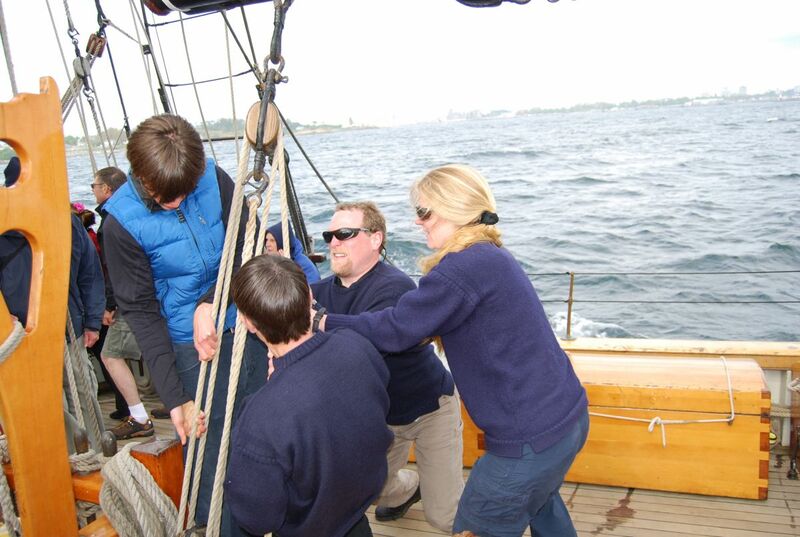 Kellei managed to get in almost all of the key activities - the was at the Helm Heading out of the harbour, climbed the rig, let the headsail go, sheeted in, and helped furl the main. I jumped in too, but the highlight for me was seeing some old friends - the photo shows one Chris Wickham (I knew him as Chris Box) Kellei, and I all taking in a bit on the Fore.